Uranium with the proton number Z=92 is the heaviest element which can be found in nature. All elements with larger proton numbers have been created artificially in nuclear reactions. 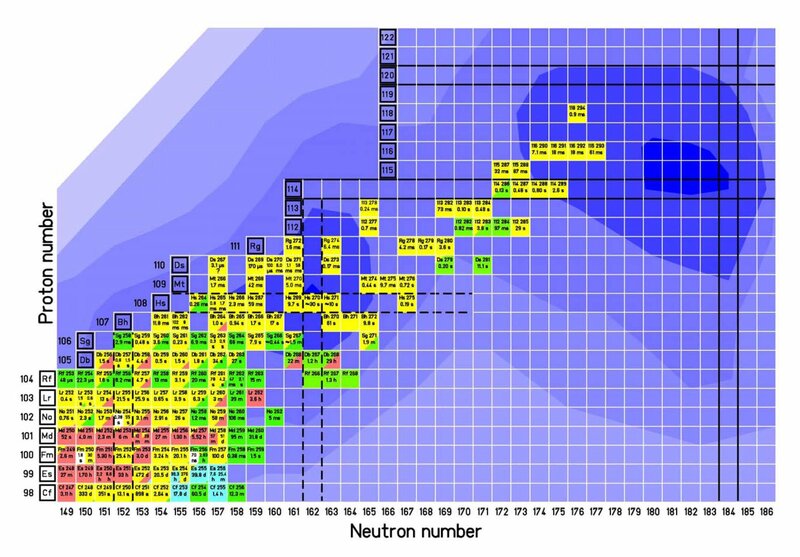 While elements up to Z=100 can be reached in neutron-capture processes with subsequent beta decays, the elements with more than 100 protons are created in nuclear fusion reactions. In order to fuse two nuclei they have to come in contact with their surfaces. Only then the nuclear forces can act which is the basic requirement for the fusion process. Before the surfaces can touch the repulsive electric forces (Coulomb repulsion) due to the charged protons in both nuclei have to be overcome. For this, one of the nuclei (projectile) is accelerated up to a velocity which is just high enough to overcome the Coulomb forces and then collides with a target nucleus which is provided as a thin foil. Usual projectile velocities for the synthesis of heavy elements are ≈10% the speed of light. Such beams are provided by the UNILAC accelerator. If projectile and target nucleus fuse, a so-called compound nucleus is formed which is still in an excited state. Most of them break up immediately but a small part goes to the ground-state by emitting a few neutrons and becomes the new element. For the synthesis of heavy elements usually the lighter of both nuclei is provided as projectile. About 1012 projectiles impinge the target every second. But a fusion reaction occurs rather rarely and becomes more and more unlikely with increasing proton numbers of the nuclei since also the Coulomb repulsion is increasing. For example, some isotopes of element 102 can be produced with a rate of one nucleus per second, while for the element 112 one nucleus per week is produced. For nuclei with more than 104 protons the repulsive Coulomb forces are already so strong that they should prevent the binding of the neutrons and protons in the nucleus. But a stabilizing effect is created by the arrangement of the nucleons on discrete energy levels (shells) which enables the existence of even heavier nuclei. All elements with Z>104 exist merely due to these "shell effects". Each shell can be occupied by a certain number of neutrons or protons. Nuclei where all shells contain the maximum possible number of nucleons ("closed shells") reveal a considerably enhanced stability in comparison to other nuclei, which means that more energy has to be spent in order to excite or decompose them. Also in the region of superheavy nuclei such closed shells are expected but they have not yet been experimentally identified. Predictions from different theoretical models expect these closed shells for proton numbers Z=114 or 120-126 and for the neutron number N=184. It is the major goal of present superheavy element research to find this so-called "island of stability".